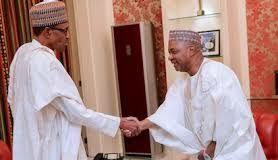 My meeting with Buhari private, says Sambo – Royal Times of Nigeria. Sambo told inquisitive journalists after he emerged from a meeting with Buhari which began just before noon, “My meeting was private”. However, the meeting sparked speculations of likely defection of the former Vice President who was was governor of Kaduna state from 2007 to 2010 and vice-president to President Goodluck Jonathan 2010 to 2015 on the platform of Peoples Democratic Party, PDP.